Following are brief excerpts from each of the ten chapters in this book. To read the entire text, add it to your shopping cart by clicking on the link below. The twenty-first century will bring with it countless new facets to our experience of being alive as humans, but none promise to make a greater difference in our lives than technology. As we have so vividly seen in the last few decades, our ability to create, distribute, and use technology is driving many of the most significant changes the human race has seen in all of history. The twenty-first century will bring with it countless new facets to our experience of being alive as humans, but none promise to make a greater difference in our lives than technology. As we have so vividly seen in the last few decades, our ability to create, distribute, and use technology is driving many of the most significant changes the human race has seen in all of history. It is truly a wonder to behold. And I hope you like it, because there is soooo much more to come. Of course, there is another side to the wonders of technology: the extraordinary rates of change that have been featured in this book. For those who adapt well to these changes, it is indeed an exciting time to be alive. For those who find such change difficult, or intimidating, it is not the most pleasant time to be around. Nonetheless, there is little we can do to stem the tide of technological advancement, so we’d better get on the band wagon and stay there as best we can. Ultimately, there simply isn’t any practical way to put the toothpaste back in the tube. The ten chapters in this module cover some of the coming high points. Here is an outline of those chapters. From tiny devices the size of a human cell to super-strong carbon nanotubes to build space elevators, small is the new big. Will robots an other intelligent machines be amazing tools, or will they take over? Find answers here. 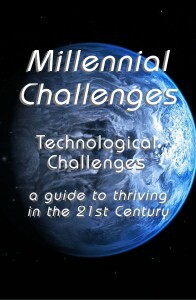 No business can escape the changes the dawn of the third millennium introduces. And though e-commerce is part of the story, there is much more to it than that. The advances in medical technology that emerging technology brings into the lives of people are the stuff of science fiction. But from genetic engineering to nano-science, the miracles are vividly real. Although putting men on the Moon was indeed an unprecidented accomplishment, the next era of space exploration will be even more dramatic. In this chapter read about the settlement of Mars and travel to the stars. Just how close are we? Many people have heard of Moore’s Law, but how many really understand what it is and what it means? It is much more powerful than most people think, and it may only be getting started. When you hear the word “robot,” what do you think of? Cyborgs like the terminator? Industrial machines that make cars? R2D2? Here we look at the past, present, and future of robotics, and the implications they have on the future of the human race. Has technology taken from us our ability to reach out and touch real people? If not, how have we avoided it? If so, can we get it back? These questions and others are answered in this chapter. Technology has brought us incredible benefits, but has it cost us our ability to connect with the “real” world? There are answers, and they may surprise you. What effect has all this technology had on human life, and what effects will it have as we move farther into our new century? What, if anything, can and should you do to benefit from it? Many of the most important innovations of this technological age are things that simply could never have attempted before. Among these, crowd-sourcing is among the most interesting and powerful. But where will it lead, and what will come with it?